“Faster, better, lower cost—pick two.” It’s a pervasive phrase expressed across a wide range of industries and markets, but is it necessarily true? According to Christoph Trachsler, CEO of Feintool North America, customers don’t have to make that choice when it comes to Feintool’s fineblanked parts services. Feintool is a world leader in the development of fineblanking systems and in the production of pre-finished fineblanked and formed components. The company operates out of facilities in Europe, Japan, China and the United States, with its North American headquarters located in Cincinnati, Ohio. With nearly 60 years of experience in the market, the company has become well known for its fineblanked parts production, fineblanking presses and technical expertise in supporting customers with research and development and prototyping. 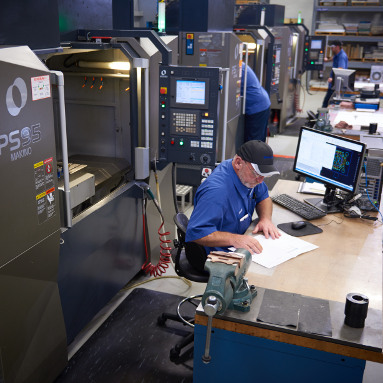 The company’s fineblanked parts services provide a cost-effective means for companies to acquire high volumes of extremely precise stamped parts. This has made Feintool a premium parts supplier to the global leaders in the automotive and medical industries. Delivering this level of repeatable precision is no easy feat, though. Due to the intense pressure of the fineblanking process, tooling used within the presses are typically composed of 64 HRc hardened steel. And according to Beat Andres, Feintool’s operations manager of tool room and production tooling, identifying a “capable machine for this type of high-speed hardmilling” is difficult. 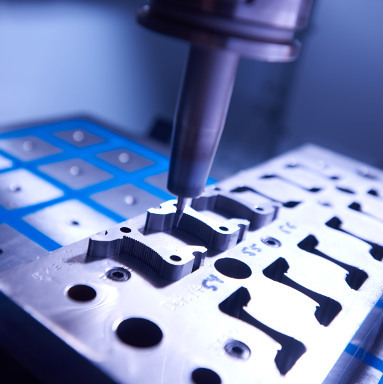 Feintool’s first investment in high-speed hardmilling occurred in 2008, following a series of collaborative tests developed and conducted alongside the company’s Japanese division. The tests were comprised of 3-D models of 64 HRc components featuring fine-tooth features, similar to automotive seat recliner components submitted by many of its customers. After delivering the test models to several leading machine-tool suppliers, Feintool received its first response just days later from Makino. Company leaders were invited to a private session at Makino’s Tokyo headquarters to see the first run of the test performed live on a V33i vertical machining center. The results of test exceeded Feintool’s expectations, achieving the desired tolerances and quality while producing the fastest cycle time among all suppliers evaluated. This success demonstrated a clear return on investment (ROI) for Feintool to invest in precision high-speed hardmilling capabilities. Since this initial investment, Feintool’s business grew substantially, requiring the company to add a third shift just to keep up with demand. By 2014, customer demand had reached Feintool’s maximum capacity, which led the company to invest in a second V33i. The tool magazine on the second V33i was increased from 25 tools to 60 tools to support greater capacity and redundant tooling for extended, unattended machining operations. Feintool continued its expansion of high-speed hardmilling capabilities with a third V33i in 2015. Designed for long hours of reliable, unattended hardmilling, the V33i vertical machining center delivers high-speed machining with superb accuracy, efficient chip removal and ease of operation. The machine’s standard 20,000-rpm spindle features Makino’s unique core-cooling and under-race lubrication system to minimize thermal distortion at high spindle speeds. Additional rigidity is achieved with the integrated construction of the spindle and drive motor, which cuts down on vibration during high-speed operation. Controlling the impact of machine movement on thermal characteristics reduces temperature impact on the machining process and yields sustainable, long-term, dynamic accuracy. As such, temperature-controlled lubricant is used throughout the machine to minimize thermal growth during cutting. Cooled elements such as core-cooled ballscrews, lubricated ball nuts, a servo motor cooling jacket system, and temperature-controlled passageways result in excellent structural temperature control. “Fineblanking tools require a very fine cutting edge in order to cut the sheet metal accurately during the stamping process, so we oftentimes coat finished chamfers with a TiCN coating to increase the tool’s performance,” said John Castle, senior supervisor of tool maintenance at Feintool. “When it comes to hand finishing the cutting edge, each tool maker might have a different method or approach. This increases the likelihood of inaccuracies in the final tool. Feintool’s success in adopting high-precision hardmilling capabilities has been based on not only its acquisition of new machine technology but also the knowledge and experience of the company’s engineers who have become more innovative in their processing techniques. As part of the company’s continuous-improvement initiative, engineers recently took aim at maximizing machine utilization rates by increasing annual cutting hours on each V33i from 4,500 hours to 6,000 hours per year. According to Andres, Feintool engineers “are continuously evaluating new process optimizations to get the most out of machine investments.” These optimizations include programming refinements, cutting-tool selection and improved work-holding solutions. One example is the recent adoption of magnetic work holding. When using previous clamping methods, Feintool was limited in the number of tools that it could machine in a single setup. By switching to magnetic work holding, engineers are now able to maximize space within the work envelope to accommodate greater productivity. Feintool engineers are also active in evaluating cutting tools. The team works closely with tooling suppliers to test new coatings and cutter sizes to achieve the perfect blend of performance and tool life. 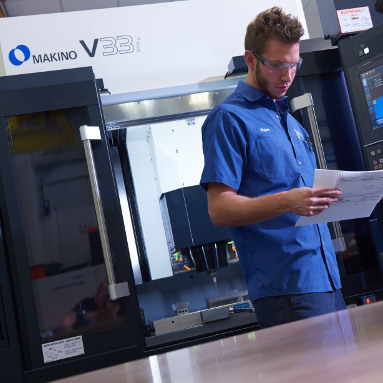 The rigidity and through-spindle coolant capabilities of the Makino machines have afforded the engineering team greater flexibility in optimizing cutting-tool selection. Feintool recently accomplished its objective of maximizing machine utilization. 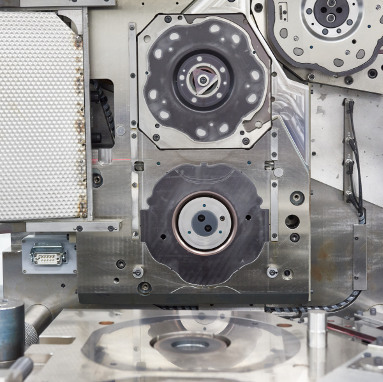 By increasing cutting time on the V33i machines 1,500 hours annually, the company was able to achieve necessary production capacity without investing in a fourth machine. 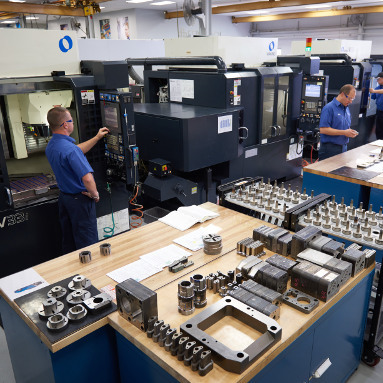 In addition to its advancements in hardmilling processes, Feintool has also made significant investments in its preheat-treated machining capabilities through the acquisition of three Makino PS95 vertical machining centers in 2014. Prior to its PS95 investments, Feintool had been outsourcing most of its preheat-treated machining processes. 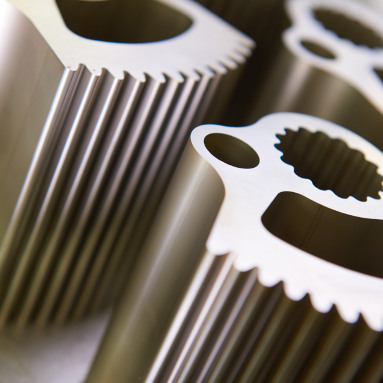 Some preheat-treated machining had been processed in-house on a set of older mills that struggled to handle the forces necessary to perform heavier cutting operations. To reduce lead-times, decrease costs and gain more control over the tool-making process, Feintool decided to invest in internal machining capabilities. Feintool tested a variety of machine-tool platforms to gauge their speed and productive capabilities. One process in particular tested each machine’s ability to perform heavy drilling in tool steel. While several machines stalled during the heavy drilling portion of the test, the PS95 with its through-spindle coolant capability completed the process without issue and achieved the fastest cycle time among all machines tested. 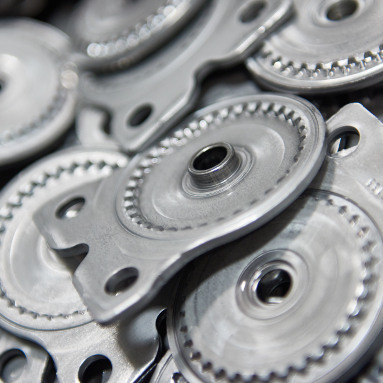 Today, Feintool’s preheat-treated machining processes are performed faster and with better quality. This performance has enabled the company to not only reduce lead-times for customers but also expedite prototyping processes to help customers get products into market faster. For Feintool, the pursuit of continual improvement isn’t simply part of some annual corporate motto; it’s a tenet that’s essential to the company’s long-term competitiveness. As such, leadership and the company’s engineering team share a number of aggressive goals to further improve the quality, delivery and cost of its fineblanking parts services. One of Feintool’s short-term goals is evaluating processing enhancements to reduce or eliminate long-runtime machine processes, such as jig grinding and EDM. The company believes that it can save a significant amount of time and investment by replacing these processes with precision milling. Increased tooling output resulting from Feintool’s milling investments have also put a strain on the company’s existing jig-grinding capacity. Rather than invest in a second jig-grinding machine, the company is currently evaluating ways that it can use the V33i machines for some jig-grinding processes. In order to adapt to changes in part complexities, tolerance requirements and delivery times, Feintool has invested in three V33i high-speed hard-milling VMCs. 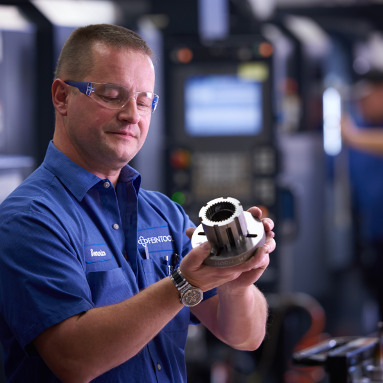 As part of the company’s continuous-improvement initiative, engineers frequently optimize processes, including increases in annual cutting hours of each machine. Since investing in the V33i high-speed hard-milling machines, handwork has been reduced by up to 30 percent. Acquired for heavy hogging of preheat-treated materials, Feintool’s PS95 machines have helped eliminate $500,000 each year in outsourcing for a full ROI in just one year. Tools produced at Feintool frequently contain extremely fine, repetitive features, such as small teeth, which require 10 microns of repeatability. Due to the intense pressure of the fineblanking process, tooling used within the presses are typically composed of 64 HRc hardened steel.